Tobacco, although not the primary component of North Carolina's economy that it once was, continues to be a major influence on the economic and cultural identity of the state. From the earliest years of European settlement, during which tobacco quickly rose to become the colony's leading export, through the era of the state's "Big Tobacco" companies and the late twentieth-century decline of the industry, the story of North Carolina agriculture has been told largely through tobacco farming and its related products. Despite shifting economic and societal trends and several far-reaching legal and governmental actions, in the early 2000s North Carolina remained a national leader in the production of several types of tobacco. Roughly 50 percent of the nation's flue-cured tobacco, which supplies flavor and aroma in cigarettes, is produced in the state. Burley, or dark leaf tobacco, which acts as a filler for cigarettes, is also grown in large volume. More than half of North Carolina's 100 counties continue to depend on the production of some type of tobacco as an economic base. 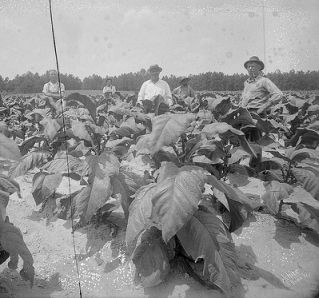 Group in tobacco field, no date (c.1920's-'30's). From the Dunn Area (Lewis White Studio) Photo Collection, PhC.121, North Carolina State Archives, Raleigh, NC, call #: PhC.121-91 .Available from http://www.flickr.com/photos/north-carolina-state-archives/3292841889/ (accessed June 27, 2012). Search Results for 'Tobacco Industry' in North Carolina Department of Cultural Resources Digital Collections. 1 January 2006 | Williams, Wiley J.; Yeargin, W. W.